CLEARWATER, Fla. -- Phillies owner John Middleton returned Saturday evening to Florida without a deal for Bryce Harper but the team feels that Middleton’s trip on his private jet to Las Vegas increased their chances to land the superstar outfielder. Middleton flew to the free agent’s hometown on Friday afternoon to meet with Harper and his agent, Scott Boras. He was scheduled to return to his home in Palm Beach, Fla., on Saturday morning but he stayed in Las Vegas as negotiations waged on. His departure from Vegas on Saturday evening, a source said, was not an indication that talks had snagged. Middleton had to be back in Palm Beach for a scheduled event. The Phillies, as they have for the last several days, remain confident they will sign Harper. The momentum is moving toward a deal being agreed upon before the end of February. It was the second time in six weeks that Middleton boarded his jet to meet Harper in Vegas as the owner is driven to end this offseason with a superstar on his roster. Middleton was accompanied in January by general manager Matt Klentak, manager Gabe Kapler, and other members of the front office. But this time, he went alone. The Phillies were the only team to meet with Harper this weekend. They see themselves as the only team willing to meet Harper’s demands of a 10-year contract worth more than the $300 million deal Manny Machado signed Friday with the San Diego Padres. The Washington Nationals said Friday that they had moved on from Harper, their slugging star of the last seven seasons. They spent $140 million on lefthander Patrick Corbin and have one of the best rosters in the National League. The Chicago White Sox, according to reports, are out of the race for Harper. The team fell short of Machado’s asking price and are not expected to meet Harper’s demands. 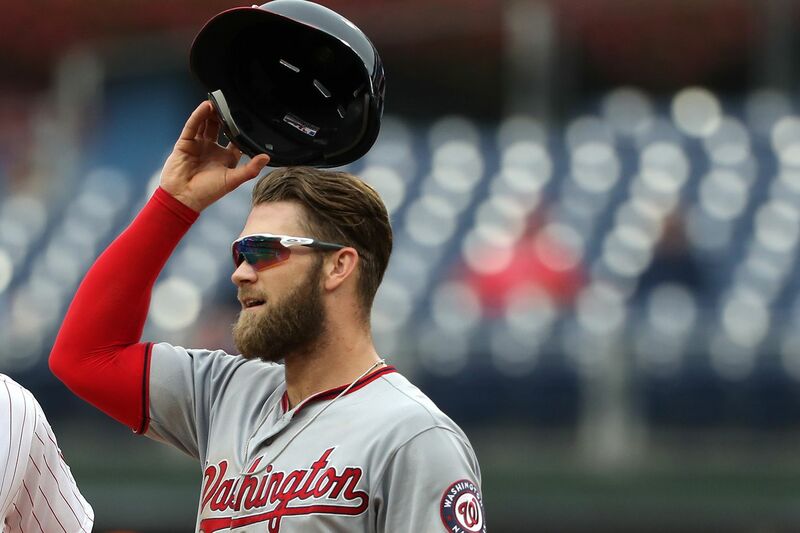 The San Francisco Giants would prefer to sign Harper to a short-term deal, instead of the long-term pact that he seeks. The market has moved in the Phillies’ direction. Bryce Harper, right, of the Nationals is congratulated by Anthony Rendon after his 2-run home run in the 1st inning against the Phillies at Citizens Bank Park on Sept. 12, 2018. If the Phillies land Harper, it would be the biggest contract ever signed by a Philadelphia athlete. The 26-year-old is a six-time All-Star and one of baseball’s biggest stars. Harper has a .952 OPS since 2015 and averages 32.25 homers per year over the last four seasons. Harper has hit more homers at Citizens Bank Park (14 in 50 games) than he has at any other visiting ballpark. He would not only provide box-office power but would give the Phillies a needed left-handed bat in their lineup. It was Machado’s deal with the Padres that forced Middleton to intensify his pursuit of Harper. The Phillies had a strong offseason as they added catcher J.T. Realmuto, outfielder Andrew McCutchen, shortstop Jean Segura, and reliever David Robertson. They spent 39 days last season in first place and the group that reported to spring training was expected to compete for a division title. But the owner knows that this offseason was built around the team’s ability to land a superstar. And that is why he fired up his white Bombardier Challenger -- with a Phillies “P” on the tail -- and headed to Las Vegas. Middleton is fully aware of what the public perception will be if the offseason that began with a declaration to “maybe even be a little bit stupid” in its spending ended without a superstar. The Phillies are motivated to sign Harper, and 36 hours in Las Vegas only increased their confidence.